If you adopt best practices at work, you can improve work, communication, security, customer handling and document management in general. 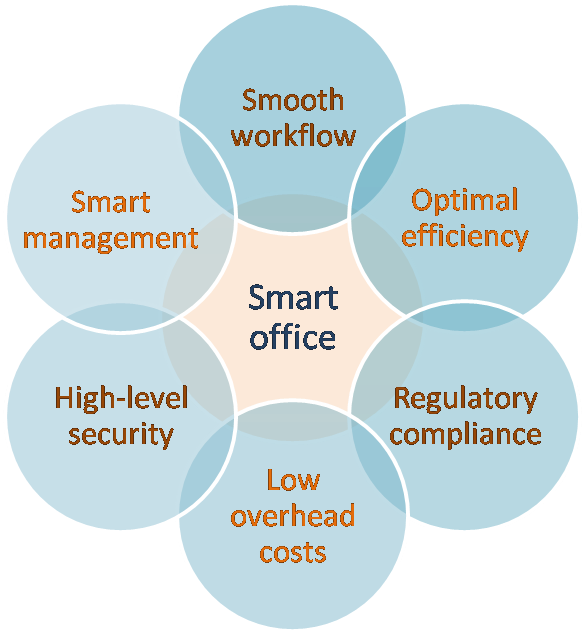 Docsvault can enhance most of these functions, improve productivity and cut costs at your workplace. 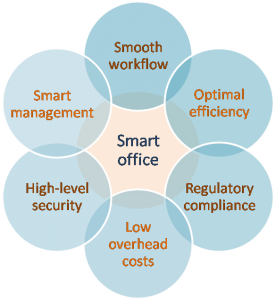 How to make your office a smart office? • Smooth workflow: Many organizations suffer a lot because of poor co-ordination between their employees. Docsvault document management software offers task management features that ensure smooth and simple workflow. • Optimal efficiency: 30% of an average employee’s time is spent in searching for documents or doing some unproductive work. Docsvault tools such as quick search, document profiling and centralized repository ensure optimal efficiency in your workplace. • Regulatory compliance: It is a requisite to meet regulations set by government if you want to sustain your business in the long run. Docsvault can ensure your data is safe and retained for e-discovery and other regulatory compliances purposes with its security and backup features. • Low-overhead costs: Docsvault allows you to go paperless so that you can save overhead costs such as storage space required for filing purposes, shipping costs, paper and printing costs and the cost to reproduce lost paper documents. All these savings combined together can lead to enormous savings. • High-level security: The fine-grained security features of Docsvault such as separate export rights, user and group based security and ‘ownership overrides’ allow users to prevent threats such as data theft, data leakage and misplaced data. • Smart management: Mid-level managers and administrators need to keep an eye on all the activities taking place in their company. The smart control features of Docsvault like audit trail, version control and email notification and alerts allow managers to keep tabs on all activities taking place in the repository. So why work hard, when you can work smart with Docsvault document management system?